After Shawn’s accident in mid-January, I hardly read a thing. I would sometimes pick up a book, but I couldn’t quiet my mind enough to read it. Life was too heavy, and it wasn’t possible to slow down without feeling the weight of it all. If I sat still in a chair for five minutes, I would feel that weight settle until my arms would lower and I had set my book aside. Since we returned from the burial in Texas, I’ve been reading almost constantly. I am weary in my bones, tired out by grief and small talk. Temporarily at least, it is a relief to let myself fall, forgetfully, into the world of a book. My Name is Lucy Barton by Elizabeth Strout is simple yet searing, a short novel that consists almost entirely of one young woman’s reminiscences and conversations while recovering from an illness in the hospital. For so many reasons, this is my literary ideal. I read the entire thing in awe that Strout could shape the most ordinary words and experiences into something so powerful. Lucy Barton’s voice will be in my head for a long while. I did not choose to read Elizabeth Alexander’s The Light of the World: A Memoir because of our experiences as a family during the past few months. I’m fairly certain I put a library hold on the title without remembering the subject, and it was delivered to my local library branch a few weeks ago. Elizabeth Alexander is a well known poet (I remember appreciating the poem she wrote for the occasion of President Obama’s first inauguration), and this is a memoir about her marriage, her husband’s unexpected death, and the first year of life without him. Honestly, it’s the kind of book I tend to avoid (too sad! ), and there has certainly been no forgetfulness while reading it. Yet, I am so glad it found it’s way to me now. It’s as much about marriage as it is about loss, and Alexander’s observations and descriptions of both are exquisite. There is a great deal of joy in this book: the joy of cooking and eating, of making art, of gardening, and the joy of witnessing your children’s growth. Alexander is open about not being a religious person, and yet her poetic sensibility and her faith in the truthfulness of poetic logic gives this honest book a spiritual weightiness that I appreciated very much. Life Among the Savages by Shirley Jackson couldn’t be more different. This hilarious domestic memoir (those savages are Jackson’s four children) is from the queen of the creepy tale. You’ve probably read her famous short story The Lottery. Her books We Have Always Lived in the Castle and The Haunting of Hill House are wonderful, spooky classics. Life Among the Savages, published in 1953, describes another world (pregnant mothers who are never far from their cigarettes and children who play cowboys and Indians with television swagger), but it is hilarious precisely because it describes so well the day to day insanity of life with small children. My strongest feeling while reading this book was gratitude. Somehow, Jackson’s deadpan delivery and knack for dialogue reminded me how sweet this phase of life can be. Yes, our houses are a mess and children possess an illogic that cannot be reasoned with, but, this book seems to say, isn’t it wonderful? 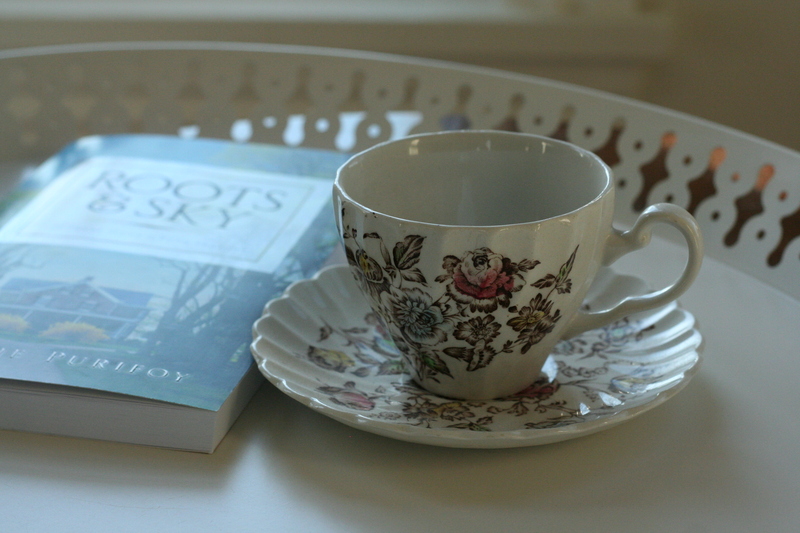 In my own book news, you can listen to an interview I recently gave about Roots and Sky. Here is my conversation with Cara Strickland for Off the Page. We talk about writing, home, seasons, liturgy, and family. And, you are all invited to join the Summer Book Club at Grace Table. This summer’s pick is Roots and Sky, and the conversation takes place in June. Sign up today! Now tell me: which books are saving your life lately? LOVED Lucy Barton SO, SO much…AND Alexander’s memoir – I read them both in the last few months. We are on the same page, girl. When Breath Becomes Air, a true story, sad yet amazing at the same time! A great read. I’ve heard so many good things about that book. Has anyone read any of Elizabeth Strout’s other books? I haven’t gotten to Lucy Barton yet, but I recently read Abide With Me. Strout’s depiction of how healing transparency can be, and the way the isolation of pride eats you little by little totally crushed me. After reviewing Karen Cushman’s new book Grayling’s Song I’ve also been on a Cushman kick. She is a surprisingly deep children’s author and every one of her books I’ve read lately encourage me in the unpleasant path (sometimes) towards bearing good fruit. I haven’t, but now I’ll be making them a priority. Maybe I’ll start with Abide With Me. It’s funny because that was actually my working title when I was writing Roots and Sky. 🙂 And I’ve never read Karen Cushman. Thanks for the recommendation! I’ve read some great nonfiction lately: I loved Orchard House by Tara Austen Weaver. Right now I’m reading Krista Tippett’s memoir, Becoming Wise, and it is so, SO good. Saving my life for sure. I really enjoyed Orchard House, too. I’ve heard so many good things about Becoming Wise – adding that to my list now. Thanks! MORE I’ve been meaning to add! Thanks for mentioning. Mothering and Daughtering…so needed with a tween girl in my home. It is written by and mother and a daughter who share their wisdom and experiences. Happier at Home by Gretchen Rubin. I just started this so no comments yet, but I love any book about loving home and being cozy at home. I am a homebody and I love my space to reflect that. Mothering and Daughtering sounds like a book I need. Thank you! Life among the Savages! And there’s Raising Demons, so you don’t have to stop! Those books got me through some sleepless months. I just finished “When God Doesn’t Fix It” by Laura Story. Reading her words felt as if I was sitting across the kitchen table from her, sharing coffee and conversation. She uses honesty and compassion to share a difficult message. It spoke to me where I am. I finished your book a few weeks ago, and it was like a few weeks worth of free therapy for me, Christie. Roots & Sky allowed me to open doors from my own childhood (in the Philippines, also frustrated by the lack of seasons), and gave me permission to create beauty (“I see something beautiful waiting to be born” – I cried when I read that line). There were many other reasons why it ministered to me; I will be re-reading it soon. Oh, thank you, Devi. This is so good to hear. Thank you for all the recommendations, Christy! I appreciate your comments. They help me decide whether the book is one I’d like. I’m into memoirs lately and you’ve given me an addition or two. You are so very welcome, Marilyn! I just finished reading My Name is Lucy Barton, thanks for the tip on that novel. If you want to read a tragedy (and perhaps you don’t want to read a tragedy) I read Burning Down the House a few weeks ago – and it does smolder. Or maybe The Storied Life of A.J. Fikry which I read cover to cover last Saturday because my littles were hammering nails outside with my husband. Or The Light Between Oceans – a fair warning that I had to finish reading it sitting on the bathroom floor with blurry vision because all the emotions. Oh Joni, I am sorry this is such a difficult time for you, but I am so pleased to know that Roots and Sky is meeting you where you are!